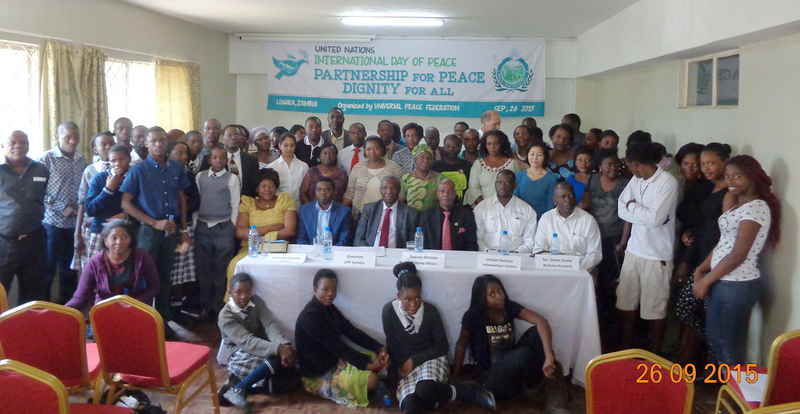 By UPF Zimbawe, Fabrice Djiamdoum: UPF Zambia chapter commemorated the UN International Day of Peace 2015 under the theme: “Partnerships for Peace: Dignity for all” on Saturday, 26th September, 2015 at Peace Embassy conference room in Lusaka. About 100 participants composed of religious leaders, NGOs leaders, teachers, students, Ambassadors for Peace attended to this conference. The second speaker was the guest of honour representing the government, the Deputy Minister of Home Affairs, Honorable Colonel Gerry Chanda. In his speech, the Deputy Minister emphasized on family as the best place to exercise a lasting peace. According to him, “the interdependence amongst nations ultimately is what has reduced our world to a global village.” “In a true, dignified partnership, each side offers something to the other(s). No one can claim to have all, and we can learn from each other” as he concluded his speech. The third speaker was Mr. Charles Nonde, Team Assistant at United Nations Information Centre. Mr. Nonde read the UN Secretary General Ban Ki Moon’s message during the International Day of Peace 2015 which he called for all the efforts on all warring parties to lay down their weapons and observe a global ceasefire. Mr. Goodwell Lungu, the Executive Director of Transparency International Zambia was the four speaker during the event. According to Mr. Lungu, Good Governance, accountability and fight against corruption are essential to create a lasting peace. He concluded his speech by requesting to joint together all the efforts from individual level to world level to partner together for peace. UPF Zambia Secretary General, Rev. Rudolf Faerber as the fifth speaker. He gave a PowerPoint Presentation on the 5 core principles of Ambassadors for Peace. At the end of his presentation, he called all the stakeholders to put hands together to create a peaceful world. Ms. Renu Patel and Mr. Arthur Dzeke Dzeke both are active students of Brahama Kumaris in Zambia. In their speeches followed by songs of meditation, they called upon the cooperation of all religions towards lasting peace. Participants had an opportunity to interact with the speakers. Afterwards, pupils from Barlastone Park Divine School sang a song and poem on peace. During the event, five (5) new Ambassadors for Peace were appointed. These are the Deputy Minister of Home Affairs, The Executive Director of Transparency International Zambia, representatives from Braham Kuamris and Mrs. Judith Mwila, Founder and President of NGO Families are Nations. Then the cutting of a cake of peace following a group photo and refreshment concluded the event. At end, participants expressed their satisfactions on different speeches and admitted having learnt on the importance of the partnership in peace and urged UPF to multiply such events to create more awareness. The event was covered and broadcasted by several media houses.